As my review opening will say, next Friday is the special Star Wars Celebration event. Here, not only will info of the latest Star Wars film be unveiled, but also we will see the first trailer and footage of the newest Star Wars: Battlefront. Seems like a smart enough time to talk about the original, no? 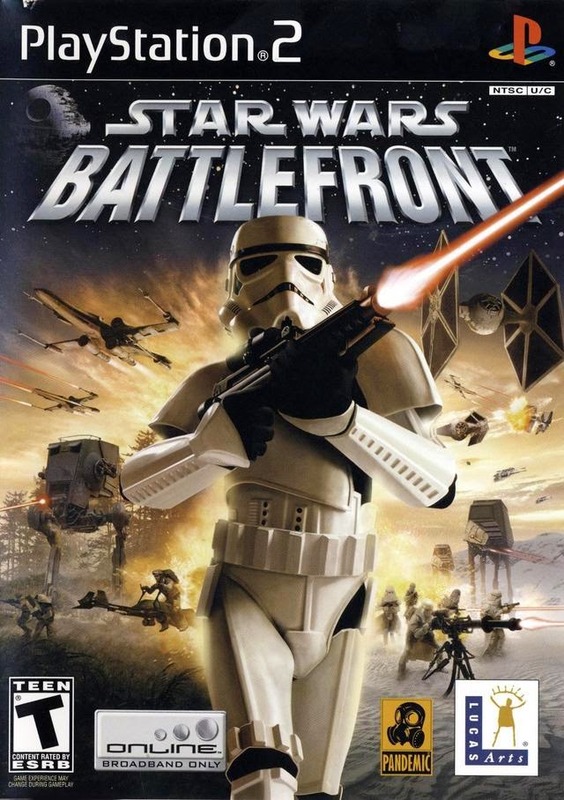 Here is my retro review of the first Star Wars: Battlefront. Battle or battle not, there is no try. On April 17, 2015 a special Star Wars Celebration event will occur, and EA will be in attendance. DICE, makers of the Battlefield series, is also going to be there, and it has been confirmed that they'll be showing off the first footage of the newest Star Wars: Battlefront. As someone who enjoyed the series in high school, I was interested by this announcement. 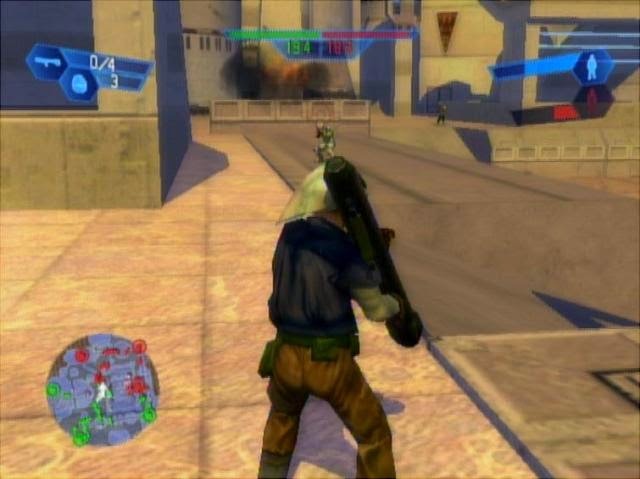 Not just for a new Battlefront game after all this time, but also for the chance to look back on the games prior to this DICE-developed entry. That's exactly what I'm going to do, and while the original Battlefront wasn't a long, long time ago, nor was it in a galaxy far, far away, it's been long enough that I can see if the game still holds up. You couldn't hit the broad side of a pile of Bantha fodder! 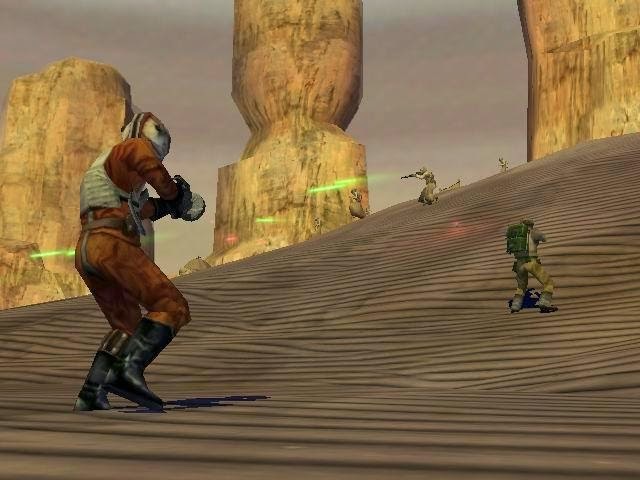 The aim of each battle in Star Wars: Battlefront is the same. Each epic encounter is a two-sided affair where the goal is to either wipe out and decimate the other side's forces completely or to capture all of the command posts on a given map. This is performed by spawning at one of your faction's command posts, choosing a class, and working with the AI to destroy the opposing side. There are five classes for each faction, but all but one class is the same for all factions. There are opportunities to choose a simple soldier with a blaster, a soldier who uses a missile launcher, great for taking out vehicles, and a sniper class, for starters. The Theed map on Naboo is one of my favorites in the game. Each of the over a dozen maps house interesting geometry to make for some engaging battles. 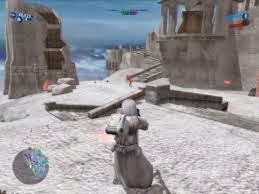 Some are wide open like the Battle of Naboo, great for hopping inside vehicles to speed across the map, while others like Mos Eisley are much more contained, filled to the brim with hiding places, choke points, sniper locations, and plenty of cover to get behind during the intense battles. 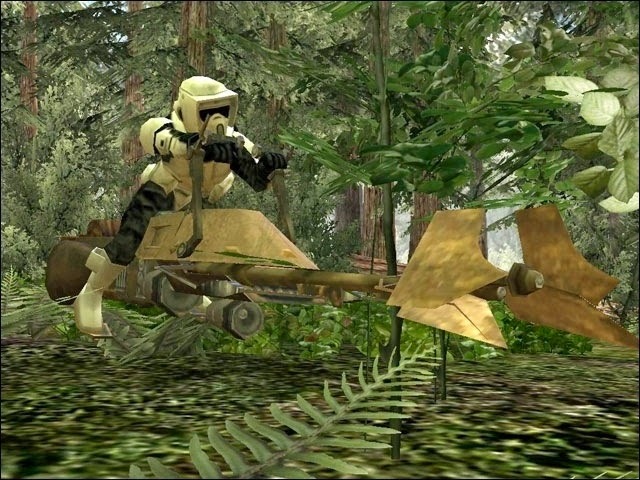 These speeder bikes can be a bit unwieldy. Mind the curves and don't crash! As stated, many maps within Battlefront offer vehicles. While these can blast and blow away infantry fighters and those on foot very easily, they come at a cost. For the faster vehicles, they're harder to control and do less damage. Meanwhile, the more powerful vehicles such as the AT-ST from the Return of the Jedi's Battle of Endor may put a dent in the opposition, but they move incredibly slowly, making them easy targets. Each vehicle can only fire their lasers so much until there is a cool-down period where they much wait for them to recharge, another point that makes them open to attack. Battlefront still invigorates me like nothing else! As entertaining as reliving battles from the Star Wars saga with you being able to fight in them is, as well as participating in battles you didn't even know you wanted to be a part of until you fight in them yourself, Star Wars: Battlefront's spectacle is sort of undermined by the poor AI. You can order them around with simple commands via the d-pad, making them follow you or stay back to defend a command post, but in general, the AI is not very bright. Sure, they'll enter a vehicle or a turret if it's nearby them, but oftentimes those that aren't part of the direct fighting will sit back and stand around doing nothing. It makes the game's battles easy for the most part. Aside from the Campaign mode, for single players there is also Galactic Conquest. Based on conflicts within the Star Wars saga, players choose from a set of planets and a side of the war. By participating in battles and winning them, you conquer planets, earn bonuses, and try to win over the entirety of the planets in that configuration. There are multiple sets of planets and sides to take on, all culminating with the player conquering the entire galaxy with their chosen faction. Alone, Star Wars: Battlefront is not that meaty of a game. Sure, there is the spectacle of being right in the middle of amazing confrontations, being a part of a big army, taking out enemies, and fighting in a massive battle. However, the single player modes are so quick to beat that the experience will have you replaying very similar missions and maps in no time at all. Battlefront is more to be played with friends, and there is the ability to play the game in split-screen with another player. This is an absolute joy to do, as you can coordinate how you're going to go about the battle, split up tasks, or just team up and blow the other faction to kingdom come. Wherever that may actually be. You don't get points for fashion. Actually, you don't get points at all in Battlefront! Star Wars: Battlefront is still a pretty good looking game, especially when you consider the scope of battle, how many soldiers on either side need to be rendered, all of the action that is taking place, and how the game does all this with very minimal slowdown. The sound is done well, offering exactly what you would hear in the movies, such as blaster lasers firing about, speeder bikes zooming past, and all of it combined with John Williams' sensational score. The original voice acting that performed in the game sounds terrific and could almost be believed to be the genuine article. Overall, Star Wars: Battlefront lacks longevity for solo players, but it contains a lot of goodness and replay value for multiplayer gamers. While the online is no longer in service, a band of two friends or family members will have a lot of fun coordinating and splitting up tasks to achieve victory in battle. As for the battles, Battlefront puts you right into the fold and the spectacle that one would expect of being in the middle of a heavy action battle of the Star Wars series. 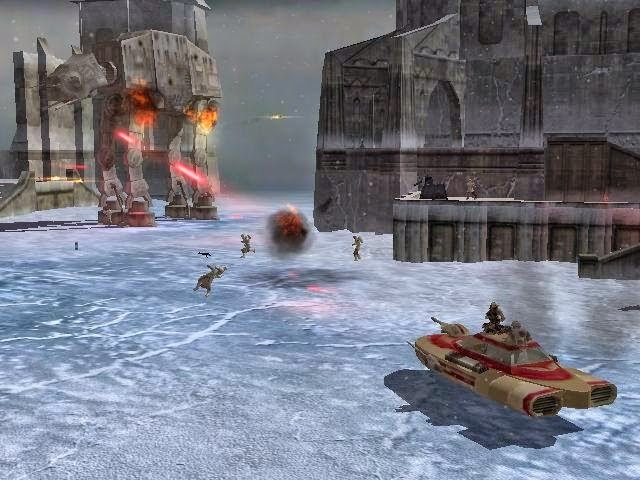 Even 11 years later and with a new DICE-developed entry in the Battlefront series incoming, the original Star Wars: Battlefront is the real deal and worthy of returning to its galaxy far, far away.